ULAN-UDE,Russia: A believer decorating the body of Hambo Lama Itighelov, a Siberian Buddhist leader who looks and feels just the same as when he died in 1927 in a temple in Ulan-Ude, the capital of the Buryat republic. (HO/AFP/Getty Images) The body of Hambo Lama Itighelov, who was a spiritual leader of Russian Buddhists from 1911 to 1927, was first exhumed from the grave in 1955, at the Lama’s request. When after the third exhumation in 2002 after 75 years since the Lama’s death, his body still showed no signs of decay, medical experts decided to examine the miracle. The official statement was issued about the body â very well preserved, without any signs of decay, muscles and inner tissues, soft joints and skin being intact. It was confirmed that the body was never embalmed or mummified. Embalming and mummifying is well known among different nations and peoples â Egyptian mummies, Christian Saints, communist leaders and others. Some bodies were found in permafrost, however when they contacted with oxygen atmosphere they perished within several hours. A Russian Lama’s Body, and His Faith, Defy Time. IVOLGINSK, Russia: A miracle has occurred here in Siberia. Or it may be a hoax. Others believe science can explain it. It is a question,it seems, of faith. The story begins in 1927, when a spiritual leader of Russia’s Buddhists gathered his students and announced his plans to die. The leader, Dashi-Dorzho Itigilov, the 12th Pandito Hambo Lama, then 75 and retired, instructed those gathered around him to “visit and look at my body” in 30 years. He crossed his legs into the lotus position, began to meditate and, chanting a Prayer for the dead, died. The years that followed were difficult for all faiths in Russia, including the Buddhists here in Buryatia an impoverished Siberian region on the Mongolian border. The Soviet Union, under Stalin, repressed most manifestations of religion, executing hundreds of lamas and destroying 46 Buddhist temples and monasteries. After World War II, Stalin relented somewhat and allowed the Buddhists to rebuild their monastery outside Ivolginsk, along a low desolate valley 35 kilometers (20 miles) from Buryatia’s capital. Ulan-Ude. But religious practice remained tightly restricted. When the 30 years had passed -it might have been 28(?) the details are murky; Itigilov’s followers did what he had asked, exhuming his remains from a cemetery in Klinkhe-Zurkhen. What they found, as the story goes, was Itigilov’s body, still in the lotus position, still perfectly intact, having defied nature’s imperative to decay. Unlike supreme Tibetan lamas, who are considered reincarnations of previous lamas and are enthroned for life, Pandito Hambo Lamas are elected by other lamas, serve relatively short terms and are free to step down. The story might have ended with the reburial had not a young lama, Bimba Dorzhiyev, turned his curiosity for history into a quest to resolve the mystery of Itigilov. He found an 88-year-old believer, Amgalan Dabayev, whose father-in-law had been there when the coffin had been opened and who himself had seen Itigilov. Dabayev led him to the grave. On sept.11, 75 years after Itigilov’s death, the body was once again lifted from the earth. This time there was a record of the event: a dozen witnesses, including two forensic experts and a photographer. The lamas who opened the coffin wore surgical masks, but they need not have. Itigilov’s body remained preserved. The current Hambo Lama ordered the body brought to Ivolginsk where it was greeted with fanfare, ringing bells and lulling chants. He ordered the body placed on the second floor of one of the monastery’s four temples, where it remains today, secreted behind heavy curtains and locked doors. The monastery’s 150 students keep a vigil on the first floor, praying around the clock, though only the lamas may see the body. The 12th Hambo Lama was born in 1852 in czarist Russia and orphaned early, according to the Buddhists’ history. At 6 he studied to become a lama and served in several monasteries in Buryatia. 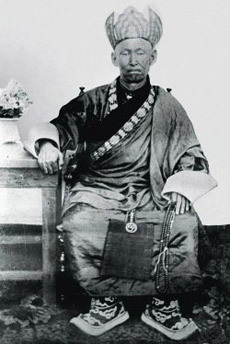 In 1911 he was nominated along with nine other candidates to become the Hambo Lama and he was ultimately appointed by the czar’s governor in Irkutsk. During his time as Hambo Lama, Itigilov is said to have strengthened the faith especially among the Buryats, a nomadic people of Mongol descent who have lived in the region for more than 30 centuries. He published religious tracts and teachings and united many of the religion’s factions. 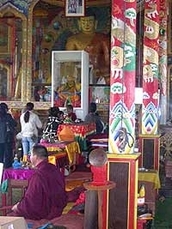 Most of Russia’s Buddhists – estimated today at 1 million – adhere to the “yellow hat” sect that is predominant in Tibet. The Dalai Lama is their highest spiritual leader. In the years since the Soviet collapse, Buryatia has remained a republic of the Russian Federation. Across Russia the Buddhists have begun to thrive again, rebuilding lost temples, opening schools and attracting new followers, even among ethnic Russians. In Moscow Vladislav Kozeltsev an expert at the Center for Biomedical Technologies, the institute that keeps the body of Lenin – who died in 1924 – in state on Red Square said the salt in the coffin might have slowed the decay but could not alone explain the preservation of the lama’s body. Other factors may include the soil and the condition of the coffin. More likely, Kozeltsev said, Itigilov suffered from a defect in the gene that hastens the decomposition of the body’s cellular structure after death. He added, “You cannot rule out some secret process of embalming” Ayusheyev says the body was preserved because Itigilov achieved a heightened state of existence through meditation known as shunyata, or emptiness. He acknowledged that there would be skepticism. When greeted with it, he relented on his own order and led a visitor into the temple to the darkened chamber where Itigilov sits atop a simple table, surrounded by candles and metal bowls holding oils. The lamas have dressed his body in a golden robe with a blue sash laid across his lap. His eyes are closed, his features blurred, though the shape of his face and his nose certainly resemble the 1913 photograph. His hands remain flexible, his nails perfectly trimmed. His skin is leathery but soft. His head is still covered in short-trimmed hair.